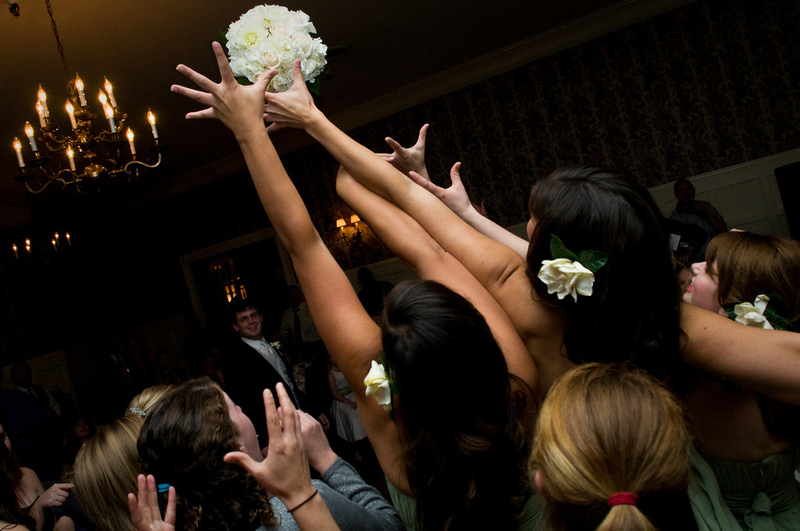 Why are brides throwing things at the reception? Is it because they are upset that their special day is ending? Are they just tired of people being in their personal bubble? Throwing items at the reception came out of desperation and self defense. It all sounds very confusing right. Why is the bride desperate and needing to defend herself? Dating back to the 14th century in France, brides were viewed as being especially lucky on their wedding day. Guests would rush toward the bride as she was leaving the reception. They wanted a piece of her so they could also be lucky. They would tear at her dress and anything she was carrying to get something, anything from her to glean some of her good fortune. Brides traditionally carried garlic, fruit blossoms, herbs and grains to drive away evil spirits and symbolize prosperity. Over time, these items were replaced with flowers which were a symbol of happiness, fertility and everlasting love. To save their dress from being ripped apart or worse yet off their body, brides started tossing parts of the flowers they were carrying to their guests. Men wanted a piece of luck also. Sometimes they need more luck than women. This is where the tradition of tossing the garter to the men came from. Some alternatives to tossing your bouquet are to present it to a newly engaged couple, or to dedicate the flowers to a special person that has passed away but is still with you in spirit. If you don’t want to single any one person out, you could have all the married couples stand up and find out who has been married the longest by having them sit down by the number of years married. If the original intent was to share some of your luck by giving them something from your special day and you are giving out favors, aren’t you already sharing something of your special day? No one has to be embarrassed. No one gets hurt, trampled or destroyed. Now that you know the history, you decide what is best for you, your family and your friends. Whether you share your flowers, your garter or a favor (gift), remember the love and happiness your wedding day brought you and your family/friends.